Rouault, G., & Skeates, C. (2019). Conference review of Psychology of Language Learning 3, Waseda University, Tokyo, Japan (June 7-10, 2018). Studies in Self-Access Learning Journal, 10(1), 126-134. This article reports on the third Psychology of Language Learning (PLL3) conference which was held at Waseda University in Tokyo June 7-10, 2018. This edition of the biennial event marked the launch of the International Association for the Psychology of Language Learning (IAPLL) as the host following its formation in 2016. The stated aims of IAPLL are to foster research, hold conferences, issue publications, cooperate with related organizations and carry on other activities for those interested in the study of the psychology of language learning throughout the world. In addition to invited plenary speakers, the call for papers sourced symposia, poster presentations, and papers under the theme “Stretching Boundaries.” Two work-in-progress sessions were held as well as an early-career researcher showcase. This paper looks broadly at the conference contents, its specific events, and the overall experience for the attendees. The success of PLL3 can be expressed using keywords often found in research into language learning motivation – words such as identity, agency, and currents. From the personalized conference bags using Japanese calligraphy to space being set aside for informal chats, PLL3 ensured plenty of opportunities for professionals new and old to the field to meet and exchange ideas. There are two main purposes for writing this conference review. One, as is tradition, is to provide an account of what actually happened during PLL3, organized by the relatively new International Association for the Psychology of Language Learning (http://www.iapll.com/). This world-class event was action packed and the four days went by quickly, so our co-authored summary is at times thin. For this, we apologize. To check specific presentation abstracts, please go to <http://www.pll3-tokyo2018.com/programmes/&gt; and download the conference handbook pdf and read the extended 3-page synopses in the conference proceedings edited by Mynard and Brady (2018). A second reason for writing this review is to provide our reaction to the conference and be constructive in highlighting what we especially enjoyed or felt could be improved. Our hope is that some of the energy from past PLL conferences, which was clearly felt in Tokyo, can be an additional resource for what is to take place in Nova Scotia in June 2020. In the late afternoon on Thursday June 7th, early-career researchers were afforded the opportunity to report on completed or ongoing research projects. Three large rooms were set aside, in which presenters were allotted 15 minutes to present, followed by 5 minutes for Q&A. The most popular theme seemed to be how various factors related to motivation, such as identity, context, and agency, are connected to WTC (Willingness to Communicate). The variety of contexts explored, such as cram schools, study abroad experiences, and regular university classes also added to the take-home values for participants. Of the four presentations observed, the presenters were well prepared, if understandably nervous, possibly as each room had at least one big name in attendance from the field of psychology in language learning. It was therefore unfortunate, though understandable, that most presentations seemed to end with a rush by the presenter to complete on time, only to be followed by an awkward pause of silence. This criticism aside, this format is one of the most important aspects that should be included at many more conferences as it provides an opportunity for a group of like-minded individuals to make suggestions on real research problems or issues. This unique format holds true potential and should be encouraged in future PLL conferences. There were five plenaries on a diverse range of topics from recognized leaders in the field. As reviewed below, in the talks attended, the roles were clearly taken seriously, the themes were covered expertly, and new insights were provided in each. For those interested in reading more about the plenary talks by Dr. Ryan and Dr. Ortega, please see the review of PLL3 written by Ping and Liu (2018). Following the opening plenary by Richard M. Ryan, who elaborated on self-determination theory and how teachers and their styles and strategies can foster (or undermine) improved autonomous engagement in their learners and the positive consequences known to follow, Ema Ushioda asked us a question. “Whose interests does language learning motivation research serve?” She then proceeded to walk us through her appeal for a more ethical agenda in the field as we were asked to consider the wider social purposes of the research we do for the academic community and for our own instrumental motivation. To frame the arc of this theme, Dr. Ushioda quoted from another plenary speaker, Lourdes Ortega, and her 2005 paper in the Modern Language Journal, “For What and for Whom Is Our Research? The Ethical as Transformative Lens in Instructed SLA.” Throughout her talk and in closing, Dr. Ushioda challenged the field of L2 motivation, and us as individuals, to consider a socially responsive direction in our scholarly efforts in researching and theorizing about motivation, while also not forgetting about the needs and interests of language teachers. This final point was made very salient with a citation noting that papers on pedagogy in top-ranked journals are down, having been relegated to more practice-focused publications. A sobering statistic eased some by the sake tasting that followed. Dr. Mimi Bong hails from South Korea and her talk was on a rather counterintuitive topic, the detrimental effects of ability validation goals. The plenary was personable, yet professional and Dr. Bong clearly has extensive experience in this area. One barrier to fully appreciating the talk more was that more than a general understanding of motivational research was needed to understand fully what she was communicating. As language teachers, it would have been perhaps more beneficial for a bit less foregrounding of her previous findings in lieu of more practical teaching implications. This criticism stated, when others in attendance were asked, their response was quite different. For example, one colleague enjoyed her talk immensely and found it both interesting (given South Korea’s emphasis on the importance on testing) and informative. Perhaps the biggest name in language motivation research, Zoltan Dörnyei dealt with an area that is seldom addressed in motivation research, perseverance. Note that Richard M. Ryan had talked of “persistence” in his opening plenary and it is this kind of awareness, interplay, and synthesis across the field by the featured speakers that can richly enhance the quality of such focused events. Dr. Dörnyei’s fluency with the topic was further enhanced with his obvious joy of teaching it to the rest of us. Using the car as a vehicle for explanation, he took his audience on a journey. When at last he arrived at his notion of perseverance, the route which we had followed meant that we had the vocabulary and background to better understand why the topic will most likely see greater coverage in journals that are of interest to language learning professionals. At many conferences, poster presentations are almost an afterthought with an inconvenient location and other activities scheduled at the same time meaning that many poster presenters see few if any people. This was not the case at PLL3 as the posters were held very near the presentation rooms. As a result, it was easy to see the location and be reminded of the poster sessions. The four poster session slots each ran for 90 minutes, half of which coincided with a coffee break offering ample time to visit the posters, review the previous session, or just “conference” and mingle. As good as the scheduling was, however, the physical layout was rather disappointing. In an attempt to accommodate the stellar response to the call for presentations, some delegates who had been rejected for a presentation may have been given the option of presenting a poster. The result was that each poster session was extremely crowded. Talking with poster presenters, the general feeling was one of being overwhelmed as each poster session was packed with interested attendees. In fact, each day there were so many people that it was actually difficult to get around the narrow space to see what was on display. Logistics aside, the themes of the posters accepted for PLL3 could be clustered in three broad, but highly relevant, categories: positive psychology and emotion, teacher training, and self-directed learning. 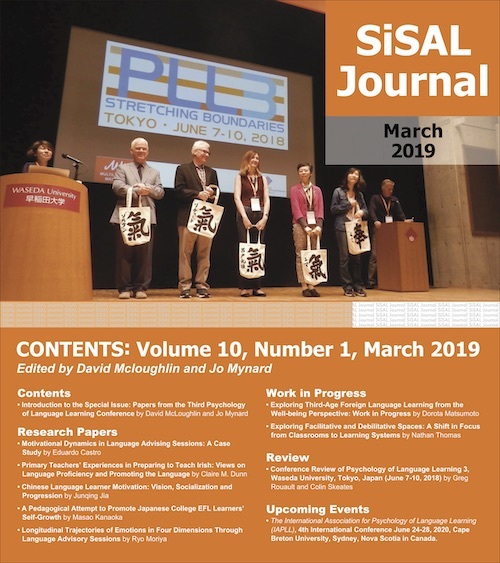 The latter, likely of greatest interest to SiSAL Journal readers included specific topics such as learner behaviors and autonomy, learner beliefs and attitudes, and L2 selves as well as reports on language advisory sessions, learner history narratives, and motivation, identity, and self-efficacy in various learning contexts or modes. At PLL3, posters were also used effectively to present research ranging from purely qualitative or quantitative based studies to those in which a mixed methods approach was used. Elliot’s (Day 4, Poster Session 4) focus of metaphor use by learners was particularly innovative as it provided a vehicle by which to better understand changes in language by learners over time. Sponseller and Kabir (Day 3, Poster Session 3) illustrated how quantitative studies continue to be a source of new avenues of research. Utilizing the WTC literature, the two researchers attempted to validate a modified version of a standardized checklist to better gauge the experiences of students who had studied overseas. Given the importance of validation studies in psychology in language learning coupled with a lack of statistical knowledge for many language teaching professionals, the poster format enabled the two presenters to answer questions not only on their topic but also on how validation studies are conducted. In the afternoons on Friday, June 8, and Saturday, June 9, there were time slots for Symposia and Work-in-progress presentations which dealt with a variety of hot topics in PLL. In a Friday session, Christina Gkonou demonstrated the scenario-based questionnaire MYE (Managing Your Emotions) developed together with her co-researcher, Rebecca Oxford (who was unfortunately unable to attend), as a tool to assess emotion-regulation strategies used by foreign language learners. Atsushi Mizumoto and Osamu Takeuchi of Kansai University profiled quantitative and qualitative data analysis techniques through Bayesian methods and text mining to better inform teachers and researchers of the psychological aspects of learning strategy use. One Saturday symposium concerned how to (simply) research complexity. The presenters (Richard Pinner, Richard J. Sampson, Joseph Falout, and Tomoko Yashima) illustrated ways they had utilized simple tools to research their context. Each presented their ideas by first giving a brief introduction and then engaged the audience with questions. Given how much teachers like to talk, the presenters created a natural bridge between the abstract and the practical. They scaffolded complexity as a theoretical concept that has real classroom application. This inclusivity meant a greater engagement on a topic that most find difficult to use. Also on Saturday, Kyle Talbot chaired a symposium which brought together the expertise of Elaine Horwitz, Phil Hiver, Sarah Mercer, Tammy Gregersen, and Peter MacIntyre on the topic of language teacher well-being. The active Q&A that followed suggested this coordinated effort on anxiety in teachers’ work, what exemplary teachers do and how they learn, control and regulation for emotional well-being, positive psychology, and the role of the teacher as mentor had really hit its mark with the audience. One means to judge the success of a presentation is by the questions it generates. Given this simple rubric, the concurrent presentations at PLL3 were a resounding success. Each of the presentations attended were conducted by professionals who had previously published papers, chapters, and books on their topics. The depth of experience showed as each presenter clearly understood the research approach and outcomes from the process intimately and was able to explain what had been done in the 25 minutes allotted. The talks generated interesting questions and with great collegiality many presenters could be found talking with attendees in the hallways afterwards. It was not a stretch to find something new to learn from each talk with aspects of specific interest to SiSAL Journal readers interested in supporting learners outside of the classroom such as: Martin Lamb’s claim that tests crowd out intrinsic motives, the ethnographic study by Alastair Henry into online media production in a blogging project where performance of the self becomes the message and the mode of communication (which unfortunately had the wrong blurb printed with no errata sheet provided), and Miriam-Tashma Baum’s discovery of a link between commitment to language learning and the quality of autobiographical reasoning found in language learning narratives. Among several presenters based in Japan, Marc Helgesen’s “10 minutes for happiness” handout, Tim Murphey’s “social testing,” and the overview of a course to develop self-directed learning skills at Kanda University of International Studies as introduced by Scott Shelton-Strong and Jo Mynard provided immediately useful takeaways and food for thought. In this review, we have tried to convey a snapshot of the third Psychology in Language Learning conference that took place on June 2018 at Waseda University in Tokyo. From creating presentation opportunities for newcomers to the field to providing a platform for experts to offer guidance, all participants should have come away with renewed interest in how psychology could be used to better understand language learning and teaching. Regarding the conference format, there are a few recommendations that we hope the PLL4 conference (and organizers in general) will consider when they plan their events. The early-career research showcase – please consider structuring it to better help researchers who have never presented before. Ideas for this could range from the researcher nominating areas of desired feedback to possibly adding time for discussion among the attendees before the Q&A. Encourage plenary speakers to provide a reading list when they submit an abstract. This could seed better questions and would aid in the uptake from each of the talks. In addition, it would also help to archive and spread knowledge after the conference on highly relevant topics such as PLL. Scaffold interaction, such as was on open display in each symposium. Teacher- Researchers like to talk. Make sure there is enough time and room for people to mingle and circulate, in particular, space for those attending the poster presentations. This increases interaction and, as a consequence, engagement in the event. If a decision about concurrent presentations needs to be made regarding quality as opposed to quantity, please consider quality to be the guiding criterion. Show off that Maritime culture – both of us are proud Canadians. Part of what made PLL3 exciting was how the organizers included local aspects from Japan. Examples of this could be seen from the use of Japanese calligraphy on conference bags, the breaking of the sake barrel on Thursday, to the selection of daily lunch boxes (included in the conference fees), and in a metropolis like Tokyo the coordinated shuttle buses to the Conference Dinner with fresh Tsukiji market seafood at the iconic Andy’s Fish restaurant. Please show the attendees what is novel to the area and in the case of PLL4 why Nova Scotia, Canada is such an incredible place. Greg Rouault has been teaching, researching, and attending conferences and PD workshops since coming to Japan in 1999. He has a Master of Applied Linguistics from Macquarie University and recently completed a graduate certificate in Sustainable Business Management. Greg’s research interests include reading literacy, ESP in business, and experiential learning. Colin Skeates first started working as an ELT professional in 1996 in northern Thailand. Since 2000, he has taught in Japan and is presently a program coordinator at Keio University and has a MA (TEFL/TESL) from The University of Birmingham. Colin’s current research interest include understanding Phenomenology in language course design. Ping, W., & Liu, H. (2018). Stretching the Boundaries, Meeting the New Challenges: A Review of PLL3. In J. Mynard & I. K. Brady (Eds). Stretching Boundaries. Papers from the Third International Psychology of Language Learning Conference, Tokyo, Japan. 7-10 June, 2018 (pp. 8-11).